I don’t mean to set you up for disappointment here. I am just as curious as you in this process. In just 10 days now those called to the High Council will officially gather. Some have already made the journey are awaiting the start of the High Council. Delegates will consist of our leaders, that much we already know. Who will be our next General? Will it be a European? Will it be an American, Canadian or South American? Will the next General be from Africa or Asia? Male or Female? I have been praying for this new leader…have you? 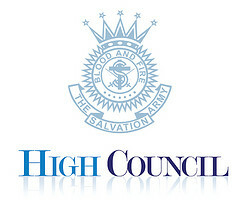 I have been praying for each leader who will be in attendance at the High Council…have you? It will be a tough office to fill…that much is most definitely true. The international pressures from both position statements and mission within an ever changing culture is certainly mounting. 2. Continuation of the Great Commission in God’s name. 3. Continue to meet human need, not because we’re a social service, but because we serve the Lord and we serve others in His name. 4. Brokering and working with nations to continue to the fight for social justice throughout the world. 5. Growing Saints and Soldiers in our Army…we need more forces for the war ahead. Who will our Next General Be? Here’s my selection…the next General will be…________________________. Who do you think it will be and why? WE DESPERATELY WOULD LIKE TO SEE A DEMOCRATIC, VISIONARY AND DEEPLY SPIRITUAL GENERAL..WE HAVE TO LEAVE BEHIND OUR MILITARY STRUCTURE-COMMAND & CONTROL SYSTEM AND REPLACE IT WITH DEMOCRATIC,TRANSPARENT, SOLDIER-FRIENDLY ORGANISATIONAL STRUCTURE….